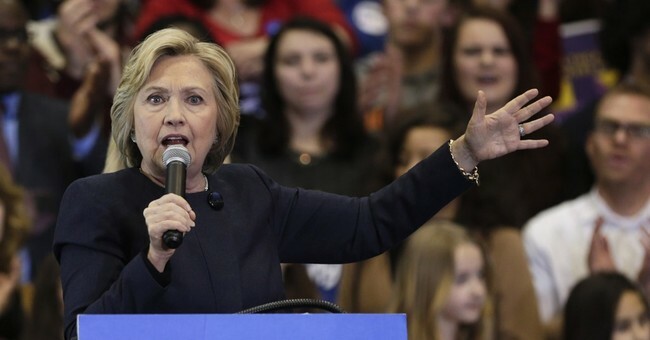 Despite Hillary Clinton's holding what her campaign advertised as a "town hall" in Brooklyn, NY on Tuesday afternoon, the media had trouble referring to it as such because she fielded zero questions from the audience. So, @HillaryClinton took zero questions at her "town hall" this afternoon Brooklyn. HRC just wrapped lengthy remarks in Brooklyn but isn't taking any questions at an event that was billed as a "town hall"
Perhaps Clinton had no time to talk to attendees because she was too busy criticizing and insulting her Republican opponents. She accused Trump of "peddling prejudice and paranoia" and called Ted Cruz's plan to surveil Muslim neighborhoods "shameful," "offensive" and "dangerous." She saved her praise for New York City Mayor Bill de Blasio's effort to "keep crime down" and beamed about the state's new $15 minimum wage hike. Interestingly, she went after Trump's abortion comments when he said women should be punished for having abortions if the procedure became illegal. Clinton denounced those remarks and told the audience that's what "all" the Republicans believe about abortion. (Not true. Some non-profit pro-life groups who are supporting Republican candidates have denounced Trump's comment.) Clinton offered her own controversial abortion answer over the weekend, claiming unborn babies have no rights under the Constitution. God forbid if that view represents all Democrats. As long as Clinton keeps shying from questions from the average American voter, she won't have to explain herself. Keep checking back to Townhall.com tonight for Wisconsin Primary results. If the polls showing Bernie Sanders with all the momentum are any indication, Clinton is in for a rough night.